Erica began her tea practice in 2007.
and on the top of a mountain. for Stillness in a world so quick to move. others in their individual tea journeys. Adapted (with blessing) from traditional Japanese Chanoyu. This ceremony has migrated out of the formalized tea house and into the realm of the public for the purpose of allowing greater access to all as a path of awakening to the present moment. 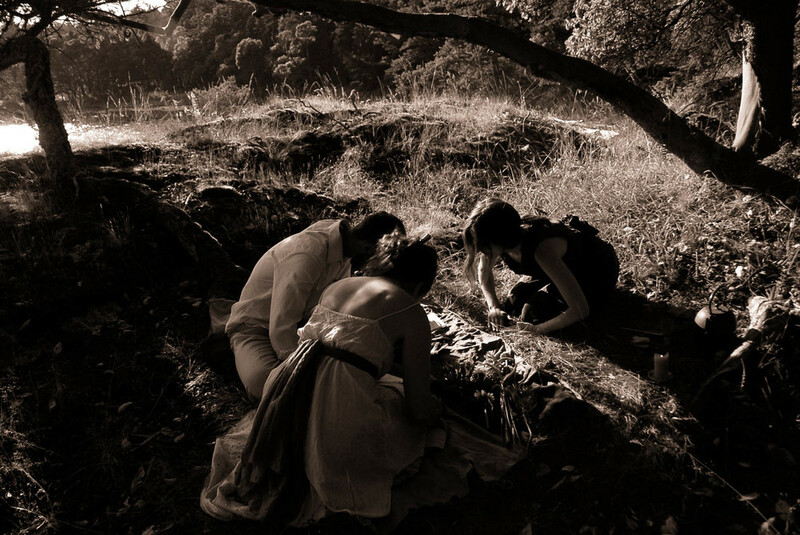 The roots of this ceremony stretch from Japan into the ancient forests of China providing a rich, multicultural lineage to guide us along the inner pathways of spiritual cultivation. 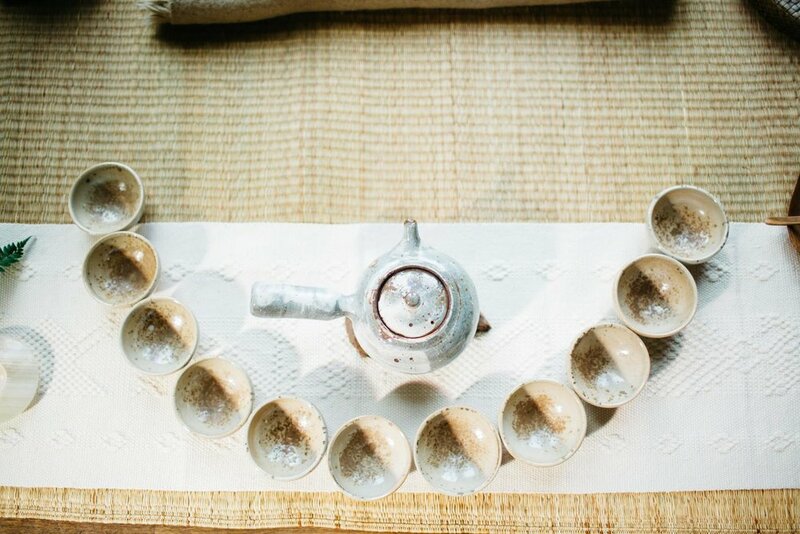 During the ceremony, guests witness the preparation of ryaku-bon (tray) tea and will receive a bowl of hand-whisked matcha accompanied with a tea sweet. It is a beautiful ceremony for integrating into wedding & anniversary celebrations or honoring life transitions & blessing ways. This ceremony is intimate and can serve up to 5 guests per session. The ceremony was passed to Erica by Hilary Sati Walker, a student of Asha Greer– artist & founder of Lama Foundation. Influenced by Taoist Chinese tradition. Erica serves loose leaf tea using either a side-handle pot or gaiwan. The profile of the particular tea chosen for the session is revealed through a succession of pouring. This ceremony is highly adaptable and can serve up to 13 guests per session and can be integrated into weddings, a friendly gathering, or a grounding meditation to begin small events events and retreats. It is also a wonderful ceremony for a forest or beach destination. Erica was introduced to this way of tea by the flourishing tea community along the west coast, and through Global Tea Hut. In Forest Tea, each guest receives a bowl of organic, ceremony-grade Matcha (powdered leaves of green tea) and a tea sweet. Chado Bowl Tea may be served in multiple infusions with a wider variety of loose leaf options including herbal blends, green, oolong, red, purple, black and pu'erh. Erica serves organic, 'living' teas that are full of vitality and grown, harvested and processed using ethical, sustainable methods. 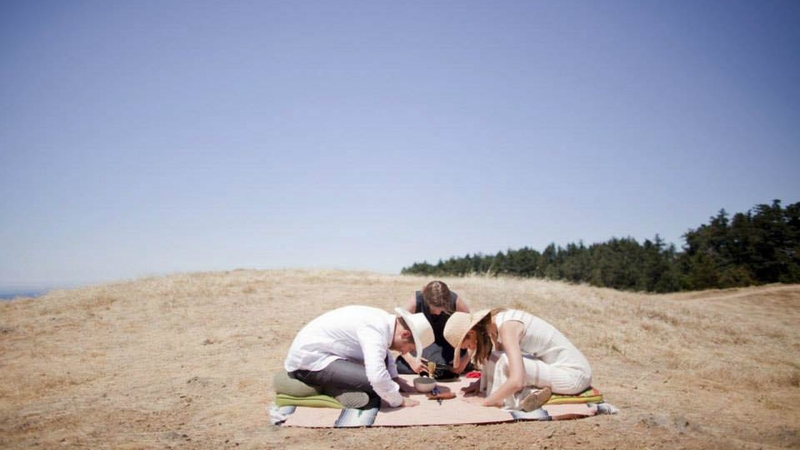 Enjoy a private tea session in the forest, on the beach, or a small island on or near Orcas Island, WA. Available May-September depending on weather. Erica's tea story: Following the birth of her first child in 2007, Erica was living in an off-the-grid cabin and feeling isolated by her immersion into Motherhood. She was the first sibling in her family to become a mother and her immediate family lived 2000 miles away. Much of her time was saturated in the rhythm of caring for her newborn and home. While grateful for her opportunity to mother her child, she felt overwhelmed with the new and seemingly never-ending tasks. Certainly there was a way to claim joy, liberation and peace in the Mundane? With this question in heart, Erica called out for a teacher, an ally, a guide– someone to help navigate these unfamiliar waters. With grace and punctuality, Tea arrived and began pouring the way with a steady, nurturing hand via Erica's friend & tea mentor, Sati. 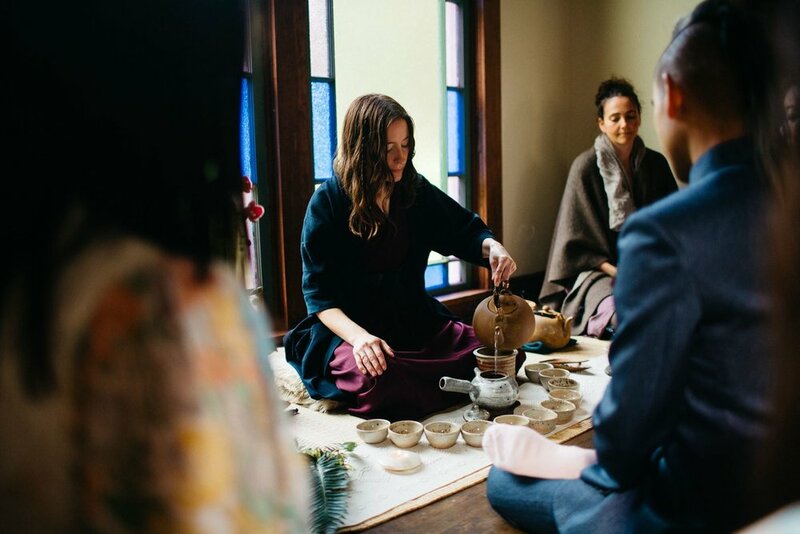 Her teacher assured that tea ceremony would awaken her awareness to the sacred in everyday life. "Brushing your teeth [washing the dishes, chopping wood, folding laundry...] will never be the same."